We are all one family from sea to shining sea. Salute the unique differences that have shaped America's heritage and unite together in musical celebration of customs, traditions and songs. 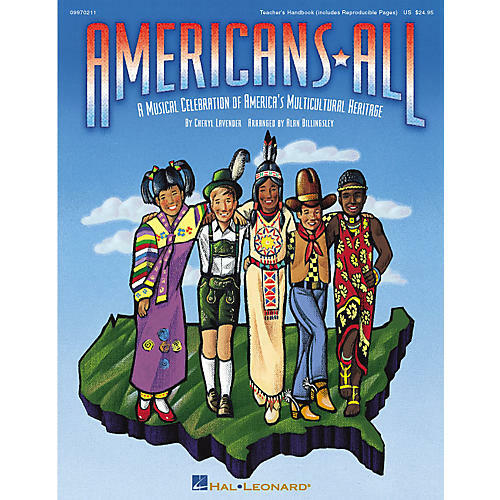 This highly adaptable musical revue for unison or two-part voices features songs and dances from around the world, short connecting dialog, reproducible singer pages, and cross-curricular activities to promote further discussion and appreciation. It also includes a complete production guide for use in the classroom and on stage, with suggestions for customizing your celebration to best fit your needs...all under one cover! Songs include: Americans All, The Winding Trail (Native American), Der Volkstanz (German), Siyahamba (South African), Come Dance a Jig (Irish), Zum Gali Gali (Israeli), Bell Song (Korean), Conga Beat (Caribbean), Partners You and I, The Kids of the U.S.A. Available: Teacher's Handbook, Performance/Accompaniment CD. Performance Time: 30 minutes. For grades 1-6.